Always fun to see your little helper in the kitchen. I know you two have fun together. The cup and saucer are delights with their buzzing bees. Yum. I'm coming right over. Hi Kitty! I have made that recipe many times! Your teacup is a pretty, a cup of tea and pie sounds good to me! Wish I could join you! 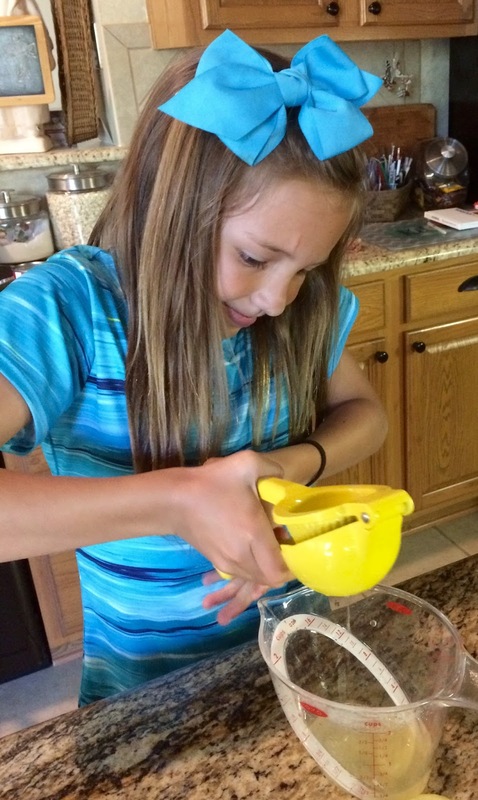 You are blessed to have such a sweet granddaughter to share your love of cooking! Lucky little girl! Have a great Memorial Day! Your pie looks delicious!Beautiful teacup!Hugs. This pie looks so good and yummy and perfect for the summer Kitty! Hope you have a nice Memorial Day. Looks delicious, Kitty! I am going to try this! Your Cissy and her competence in the kitchen reminds me of my granddaughter Mackenzie at that age. Your pie looks great, Kitty! I loved seeing your little helper. I think she is getting quite a cooking education from you! I have never seen the device she is using to juice the lemons; mine is quite different: a glass jar on the bottom, and on top something you put the lemon on and twist it, and the juice runs down into the glass jar. Have a nice summer! I would love to stop by and chat as we indulge in a piece of your pie. Have a nice Memorial Day and a blessed week. This looks so delicious! I am totally trying this out soon :) Love your blog! Your whipped pie is just what I need for this heat. Summer is here! I have a similar lemon squeezer. My parents use lemons all the time so a few years ago, my brother (who lives in a different province) got them a fancy electric squeezer. Of course, they only use it when he's around. HA! Wow is that ever easy! Thanks for the recipe &other darling photo of your sweet granddaughter! She is growing up right before our eyes! Well I should NOT be reading this at 9:30 at night when I'm hungry. Good thing I don't have the ingredients....yet! This looks SO good. Love that cup and saucer and your little helper! Oh, my goodness...this looks SO yummy! I LOVE strawberries! Thank you for another wonderful recipe. You are such a blessing! I am praying for you, sweet friend, and sending lots of love to you. God bless you! What a simple and easy dessert! Looks fantastic. And fresh lemon juice? Why yes...I do think I'll have a big piece or two. Lovely! So tickled to know you had a little helper! You and your granddaughter not only make delicious desserts but memories as well. 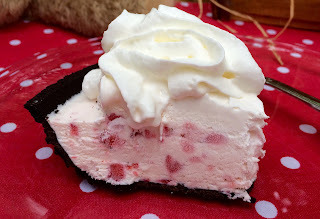 That Strawberry Whipped Sensation Pie looks positively wicked! The tea cup is such a sweet one. Bees and strawberries, a perfect match. Oh my...that pie looks so delicious and also refreshing treat for summertime. 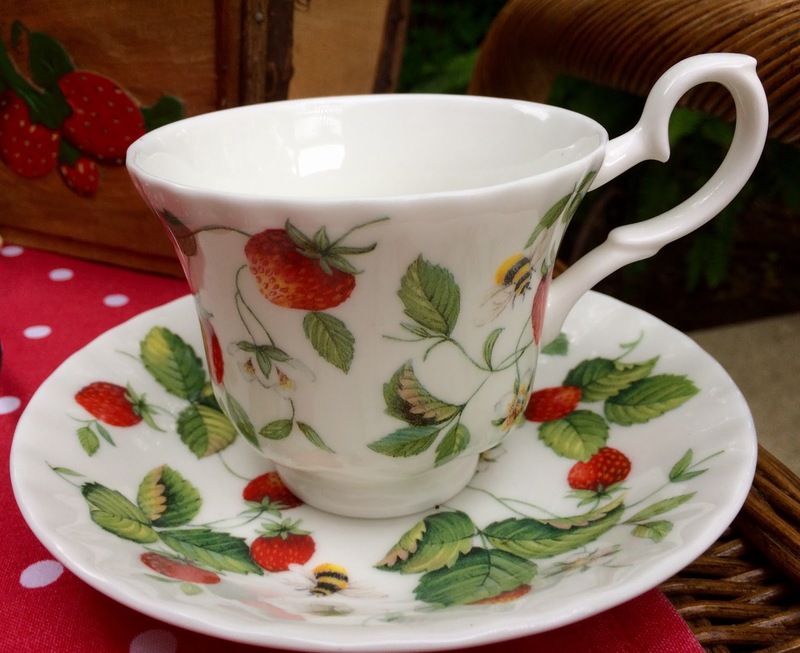 Your strawberry teacup is just perfect for sipping along as you enjoy the yummy treat...I love the bees as well! And I love the expression on Cissy's face...squeezing lemons is a hard job! Have a blessed week, Kitty! HUGS! Hi Kitty, Oh how delicious this looks. Love it and the easy quick recipe it is. Great to make and have on hand. Your friend will love it. Cissy is so cute preparing the lemon juice. She is gaining so many homemaking skills that are going to be so helpful in life. Love your beautiful teacup and saucer. The bees are so cute. Such a lovely setting on a warm afternoon. Thanks for sharing the recipe. OH yum, anything with sweetened condensed milk in it is always good! A wonderful recipe for young bakers! She's adorable Kitty! Oh yes, I would LOVE to stop by! And not just for the delicious looking pie, but also for some sweet fellowship with you, my friend. Such a decadent looking pie and easy enough to make. I purchased a bottle of lemon juice to use for baking etc. but when I read the label it contains sulphites so I'm not sure I want to use it. I love the teacup, and the Pie looks delicious! Your Granddaughter is so pretty! This sounds delicious but, not being in the states, I wonder what frozen whipped topping is? Hello Kitty, this strawberry dessert looks perfect for the summer. Can one ever have too many strawberries??? I think not! Your teacup is a favorite of mine and the pie looke wonderful! Saving that recipe! Nice to have such efficient helpers! Thanks so much for linking to Tuesday Cuppa Tea! Looking fabulous Kitty. 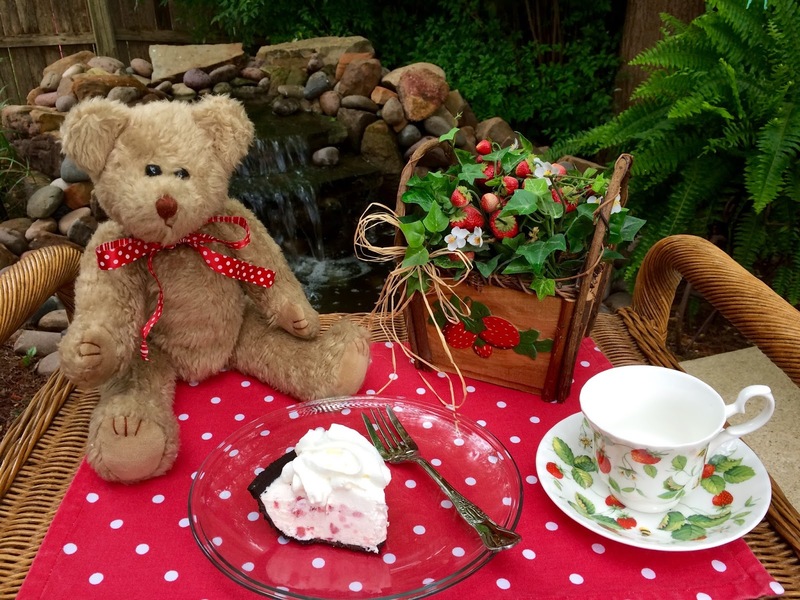 The strawberry cup is so cute and perfect to compliment your luscious strawberry cream pie. I wish I could join you. this looks sooo good...my mama made a Strawberry pie that was beyond good..i think i have the recipe somewhere...must look. I'd love to eat a slice and sip tea from that pretty teacup! The pie sounds delicious Kitty! Thanks for sharing with SYC. Kitty, it looks so pretty! And I love that teacup and saucer. I've never seen that pattern - strawberries AND bees! Kitty, I just made the pie and it's in the freezer for later. I'm going to include it in my Flag Day blog post. It's perfect for our local strawberry season which is coming up soon. I am loving this, it looks wonderful! Thanks for sharing this at the Dishing It & Digging It Link Party. Your recipe is featured on Full Plate Thursday this week with the most page views! Thanks so much for sharing it with us, we have really enjoyed it and hope you enjoy your new Red Plate!